Things of interest, a day to day story, sometimes including photos, videos, or other links. Another Chris Noto got my domain name! Rainbow Cichlids, Busy at 4:16 a.m. I woke up, thirsty, and wound up sitting here in the kitchen, with the computer on. I just looked up at the ten gallon tank with five nine month old Rainbow Cichlids, Herotilapia multispinosa, in it, to see them, very shy in the daytime, cavorting freely, and in fine, full color. Amazing. Today, for the first time ever, I made a moss covered piece of driftwood. I was inspired to do so by Jason Baliban's presentation at Sunday's meeting of the Atlanta Area Aquarium Associsation, at which he delivered a Power Point presentation on the basics of the aquascapers' art, and then aquascaped a moderate sized aquarium, from the bare tank, up. I did my bit of elementary aquascaping, this evening, by wrapping clumps of good old fashioned Java Moss around a branch, tying dark, heavy cotton thread to the branch, and then wrapping the thread in a spiral over the moss. A couple of such passes, one on each of two sides of the branch, sufficed for a pretty good cover. Then a few snips with scissors, where the moss came up in obvious loops between the wrappings of thread, served to obscure a good bit of the man made nature of the artifact. Fun. Easy. Pretty. Pictures to come. I've loved Pee-wee since the Eighties, when our whole family watched Pee-wee's Playhouse every Saturday morning. I'm so jealous that he got an iPad before I did! When I was about ten or eleven years old, my family took a trip to Hot Springs, Arkansas. I remember my brother Frank and I prowling the area around the motel we were staying in. I turned over a piece of shale, and found a scorpion, which promptly stung me. It burned like anything, which scared me greatly, 'cause I didn't know how potent the toxin was. Probable Truth: under the influence of scarey Western Movie Nonsense, I thought I might die if untreated. My dad, though, was pretty much guaranteed to fly into a rage if I came clean with the fact that I'd gotten stung. So, real casual-like, I initiated a conversation with the adults in the group about scorpions, and real, real casually checked out what they knew about scorpion stings. It sounded to me like it was about as bad as a bee sting, so I decided not to say anything further on the subject. I'll never forget the day, though. Here's the guy who got me: "The only scorpion known to occur in Arkansas . . . the common striped bark scorpion." "Death and severe allergic reactions have been attributed to the striped bark scorpions, but such claims have never been substantiated by reputable sources." They've been doing this for eleven years now, at the beginning of every year. It happens on The Well, one of the earliest open-to-the-public Internet communities. Chairman Bruce, as he's known to old-hand science fiction fans whose memories go back to the first days of the cyberpunk movement, plays Delphic Oracle. All the rest of us get to ask questions, and kibbitz. Thoughtful, challenging, wonderful, fun. The floating Amazon Frogbit, Limnobium laevigatum, was thriving then, along with the Hygrophila corymbosa to the right, the Hygrophila difformis, the taller plant on the left, and the Dwarf Amazon Swordplant, Echinodorus tenellus, in the foreground. There is also a tiny bit of the formerly dominant Myriophyllum matogrossense, a lacy bunch plant, in lower center right. This was all grown using fermented-yeast-and-sugar DIY CO2, though I've since switched over to pressurized CO2 setup with a tank, regulator, pH probe and controller. My lighting is two 5500k 13 watt screw-in compact fluorescent bulbs in the original equipment somewhat funky plastic hood. I use Seachem liquid fertilizers. The vertebrate population includes one male Platinum Guppy, who shows up as a blur about halfway from top to bottom, almost to the left margin of the tank. Also, five Neon Tetras, three Corydoras trilineatus, one Siamese Algae Eater, and two Badis badis. There were a couple of large pond snails, but I guess they died of old age. No other invertebrates that I know of. This shot is, so far, the height of my artistry as a planted aquarium geek. I've been doing a bit of browsing just now, and wound up following a link from a blog I discovered a while back, Guppyfocus. This guy does some very interesting crosses, and also posts pictures of visits to the fishrooms of other breeders. The fish above is from his most recent blog post, titled "piebald reticulata". The first link a the forum is this, a thread that shows pictures of Tobi's, the Guppyfocus guy's, fishroom. The last pic in the series is interesting, as Tobi has mentioned a "Channa" that he feeds culled guppies to. It's a nice little planted tank, and I think you can see the snakehead hovering in mid-tank. According to this link, this may be the fish that has been terrorizing anglers in my brother's suburban D.C. area in recent years. 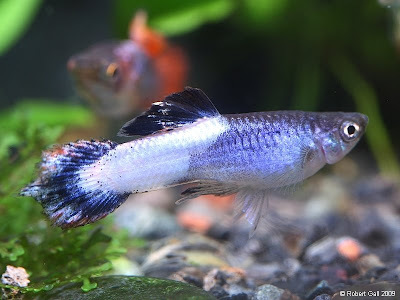 Next, a thread in which a young woman guppy breeder shares a series of shots of a group of male guppies, posing the group a puzzle as to how, genetically, she reached their phenotype, genetics-talk for their appearance. Finally, here's the forum's "portal" page, pumped through Google Translate. Wait, there's more! They're like peanuts, I can't stop. Two amazing "Pink Moscow Males". I hope you enjoyed the tour. I was directed to this by Bruce Sterling's twitter stream. I just found the text quoted below in this article. Both plants and algae adapt to CO2 in their environment. To do this, they produces what’s call the Rubisco. The Rubisco is an enzyme that is used for carbon fixation. In a low CO2 environment, plants and algae will produces more Rubisco so they can fix carbon from the KH (-HCO3). When there is plenty of CO2, plants and algae no longer need the Rubisco so they simply get rid of it. Problems show up when CO2 is unstable because algae are much faster to adapt to low CO2 than plants. So everytime your CO2 is changing, algae have a chance to outcompete the plants. When I saw the enzyme RuBisCO mentioned, I remembered the first time I heard that word, which was at a meeting of the Atlanta Area Aquarium Association, during member Brian Revennaugh's great presentation on planted aquariums. If you'd been in the room with me, you probably could have seen the light go on over my head. Aha! 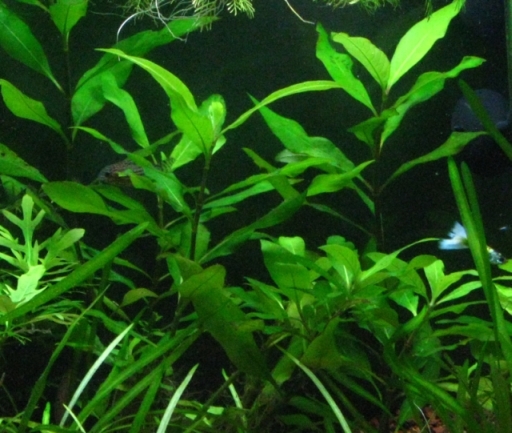 I've been a student of aquarium keeping, and especially planted aquariums, my whole life, and it is wonderful to be able to keep learning things about it. Addendum: Brian R. adds some depth and precision in his post at the AAAA Forum discussion of this topic.